Vanguard Natural Resources, LLC continues to focus on natural gas to fuel its growing dividend to investors. Vanguard Natural Resources, LLC (NASDAQOTH:VNRSQ) continues to buck the trend in the energy sector by focusing on natural gas to grow its dividend. The master limited partnership increased its already large bet on natural gas as it announced it was spending $278 million to buy natural gas focused properties in North Louisiana and East Texas. The deal adds 23,000 net acres and currently produces 17.5 MMcfe per day, with 67% of that production being dry natural gas, and the rest natural gas liquids and oil. Vanguard Natural Resources has really focused on acquiring natural gas properties over the past four years. That's a different approach from most of its peers, which have really backed off natural gas as the price remains well off the highs it hit in 2008 as the following chart notes. 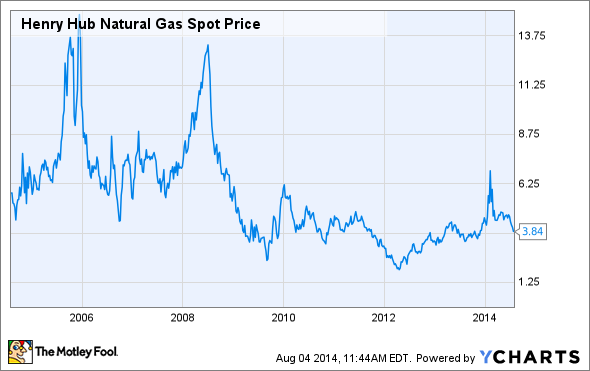 Plunging natural gas prices have caused many producers to simply give up on drilling for gas. These producers are also selling off mature natural gas properties in order to reinvest the cash into higher valued oil and natural gas liquids properties. Vanguard Natural Resources, on the other hand, has been a willing buyer of these properties because it's getting the natural gas reserves in the ground at fire sale prices. As the chart in the right-hand side of the following slide notes, Vanguard Natural Resources has been especially aggressive in acquiring natural gas properties in the years since the price of natural gas plunged. Source: Vanguard Natural Resources, LLC Investor Presentation (link opens a PDF). Over this time, Vanguard Natural Resources has really transformed its portfolio into one that's focused on natural gas. In 2011, just 34% of its reserves were natural gas, however, just two years later, its reserves were 67% natural gas. The shift is due to its focus on value, as natural gas properties are being sold for a better value than oil properties. In addition to value, Vanguard Natural Resources is also picking up a long-term option on the price of natural gas as its profits will head higher if natural gas prices heat up. It's quite the opposite approach of peers like BreitBurn Energy Partners (NASDAQOTH:BBEPQ), which has really focused its efforts to boost its oil reserves. In fact, BreitBurn Energy Partners recently announced it was acquiring an oil-focused rival, which makes the combined entity the largest oil-weighted upstream MLP. This focus on acquiring natural gas assets impacts the company's dividend, or distributions, in two ways. First, by acquiring less expensive natural gas assets, Vanguard Natural Resources can achieve greater initial accretion to its distributable cash flow for the same amount of capital. Greater cash flow accretion means the company has the ability to boost its dividend at a higher rate right from the start than if it would have acquired an oil-rich property. In addition to that, because the company is acquiring long-lived natural gas properties, it holds a long-term option on the prices of natural gas. The company's latest deal included reserves that have an estimated reserve life of 23 years. That's a long time, and because time is on its side, it can wait for the fundamentals of the natural gas market to shift in its favor. In fact, as the following slide notes, there are several compelling reasons natural gas prices could heat up in the future. As that slide noted, natural gas demand growth is expected to outstrip supply growth through 2018. Because of that, the odds are good that natural gas prices will creep higher over the long term. As natural gas prices heat up, Vanguard Natural Resources' cash flow from its natural gas properties should also increase, which should fuel higher dividends to investors. Vanguard Natural Resources has focused much of its acquisition dollars on out of favor natural gas properties and instead letting peers like BreitBurn Energy Partners pay up to chase oil fueled growth. Because of this, its patience could really could pay off down the road, when natural gas prices increase, as that could add even more growth to the company's dividend.